When we left off with part I, the Camaro had been pushed out of the garage for the first time in 10 years. It was washed, pushed back into the garage, had its fuel filer/oil & filter/battery changed, and was generally looked over for any obvious issues. Oh, and new hood struts were ordered. Those familiar with F-bodies know what’s coming next. For those who aren’t, many cars in the last 30 years have access panels in the rear for the fuel pump. The Camaro does not, so you better get used to the idea of dropping the fuel tank. (It turns out, we would have needed to drop the tank anyway, but I’ll get to that in a bit). First step was to remove the exhaust. As it turns out, 30 year old exhaust isn’t fun to work with. While the connection with the catalytic converter was fairly easy, the rear section proved quite difficult. Once it was determined that the exhaust wasn’t salvageable (the first sign was a hole in one of the tail pipes), the job became much easier. An interesting find, but the muffler sounded like a maraca when shaken. 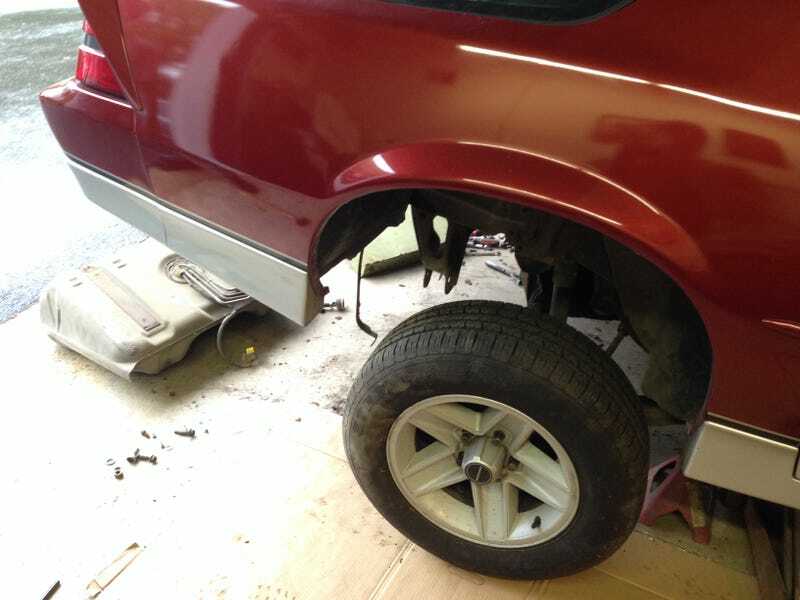 The exhaust from the catalytic converter was replaced with Walker exhaust components, with a Magnaflow muffler. ...and the fuel pump assembly. Yeah, no wonder it wasn’t working. So yeah, a new fuel pump, sending unit, and fuel tank were ordered. We eventually got the new tank and related parts installed, after some issues with the filler neck. That’s a story on its own; on a whim, we decided to try the gas cap on the new tank before installation. The one that came with the new tank didn’t fit. We tried the one from the old tank; it didn’t fit either. Both caps fit the old tank no problem. We had some back and forth with Summit, where the tank was bought from. After looking online and getting unsatisfactory responses from Summit, we decided to go another route. We ended up cutting the end of both filler necks off, and using a length of filler neck hose (from fillernecksupply.com, of course) to attach the old filler neck end to the new filler neck and tank. Not exactly a factory approved solution, but it seemed to work. We got everything put back together, installed the new exhaust, filled it with ethanol free gas, and proceeded to give it a try. With a turn of the key to on, the fuel pump actually primed. Just hearing the fuel pump turn on was a major victory. We then noticed a puddle of gas under the car. We turned the key again to find the source. It turns out, when we replaced the fuel filter back in May, we managed to cross thread it enough that it wasn’t installed quite right. We then learned how much easier it was to change the filter with the car off the ground. We then tried to start it. It would just barely catch, then die. We suspect having the MAF unplugged may have had a bit to do with it. If anything, it couldn’t have helped. We gave it another try, and this time it would run for a bit, but really rough. We tried a few more times with the same result. We tested that the fuel lines up to the engine bay were clear. Next on the list of things to check were the injectors. Surprisingly, that 2.8 is a Multi-Port engine, so it had 6 injectors. We rigged up a test setup consisting of a 12v battery from a lawn tractor and a can of carb cleaner with 4 diameters of hoses to adapt an injector to the can and be able to build pressure. We then unscientifically tested the spray pattern of each injector. 3 were ok, 2 were quite bad, and one was completely dead. Right, so that’s most likely the issue then! We ordered a new set of injectors (I love how cheap parts are on this car, a set of 6 new ones was $60). We installed those the next weekend, and it fired right up. That was the first time the Camaro actually ran in 8 years! We then proceeded to run it up and down the driveway (having a long driveway is quite nice! ).